being an artist on the road, whether she prefers straight or bendy straws, and what life is really all about. Loch Ness monster or Boogie Man? Socks, sandals, or socks with sandals? Socks with Sandals ALL DAY ER DAY. My name is Lyn Sweet, and I am a projection from the intergalactic star space entity, weaving my way through our cosmic universe in order to gather research for planets we call unknown to this Earth. I am an artist, I have been creating since I was very young and hope to continue developing my skills and concepts every year. I was placed on Earth in San Diego, California as a human bean in 1993. From there I moved to Missouri, then Illinois, then back to Missouri. Missouri is where I finished my four year degree in Fine Arts. I normally just tell people I’m from the Midwest. Since I was young I was drawn toward creating. I remember as early as kindergarten I would create these bound palm-size stories that were “origin” stories like “Where did the Zebra get its stripes?” or “Where does Beeswax come from?” I would get in trouble in class for using up all the scrap paper to put together these illustrated books. I learned to knit at age 10 and made a scarf business around my elementary school. I aspired to illustrate children books until I went to middle school. Then in high school I picked up photography and started my own photography business at age 16. Between the ages of 16 and 18 I ended up shooting over 150 clients, interned with a National Geographic photographer who was from the town I lived in, and interned in California with a photographer who was shooting for Desiel. I picked up an interest in painting my senior year of high school and continued to experiment with different mediums through college while I earned a Bachelor in Fine Arts with an emphasis in Graphic Design. Describe your current living situation, and how long have you been living this way? I currently live in my 2003 Dodge converted campervan. I don’t have a set plan other than exploring, creating and manifesting new experiences. I have been living this way for 7+ months now, since July 1, 2016. I TA’ed a drawing and painting class during my last semester of school and worked four jobs for a year in order to pay for the van to start making my artist career mobile. 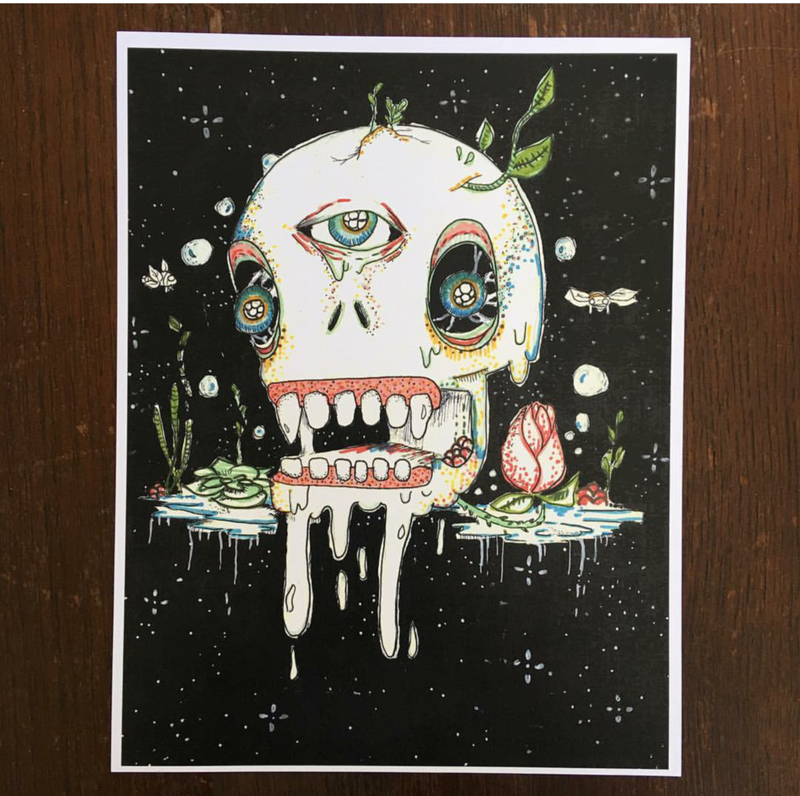 I started going to music festivals in 2011 and would walk around the campsites selling prints of my work. I did this every summer since then and made enough money each summer I didn’t have to work as much during the other months of the year. Because of these experiences I knew I could make a living on the road with my art. I stay at free campsites, Walmart parking lots, gas stations, neighborhoods, friends/relative’s driveways and the occasional couch surfer’s place. The average nights I spend in one place is about three. What influenced you to hit the road and pursue this path? A lot of things influenced me to want to live this way, and it started when I was very young. My early childhood (from age 0-11) my family went camping cross country quite a bit. We were always outdoors, going on hikes, scrambling up rocks, swimming in lakes and creeks, sleeping in tents and getting lost on random highways in the West. When I got a little older our camping trips slowed down, but my love for the outdoors and exploring never ceased. My brother, sister and I would take a few camping trips together and my dad would drive with me through the Midwest on any random weekend he could. When I got to college I started using my summers as my travel months where I would take two week road trips to the west coast or go music festival hopping every weekend. I love driving, I love exploring, I love the unknown, I love mystery. 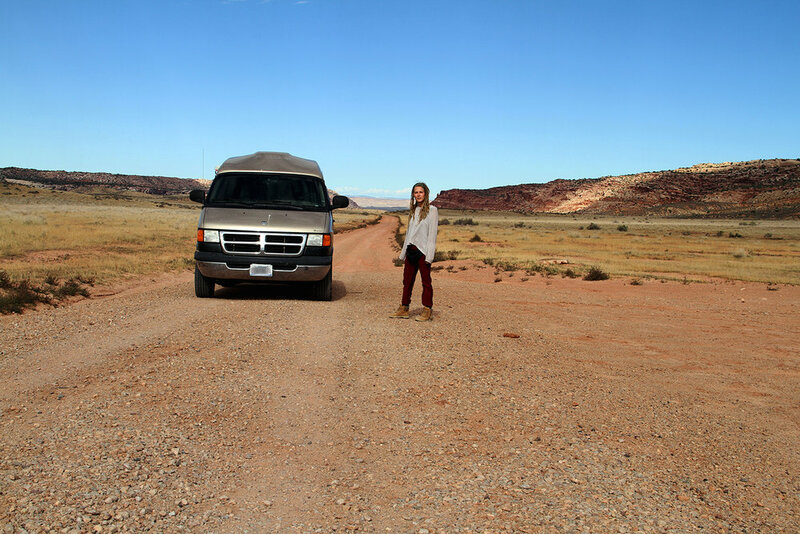 So moving into a van and traveling full-time wasn’t that out of the ordinary idea for me. I’ve never had more of a sense of home as I do on the road. My family is very supportive of my current lifestyle which is something I am very thankful for. They knew that I would end up doing something like this at some point in my life so they weren’t surprised when I actually did it. Both my mom and dad have always encouraged me to follow my dream of attempting to be a successful artist even though they warned me that I might end up the cliche “Starving Artist” but that if I wanted to risk living a penny pinching life that I would still be happy if I was doing what I loved. Money doesn’t really matter if you have a meal to eat and a place to sleep. I make enough to do those things and that’s all I really need in life. I wouldn’t consider myself a “starving artist” because I live very comfortably but that’s my perspective. I live simply, I save my money and live very frugally. I don’t pay for campsites, I make almost all of my own meals instead of eating out, and I don’t go shopping for unnecessary items. I also knew I could do it financially because I had been freelancing and selling my artwork for about six years before I made the move. I made enough money at music festivals and art fairs that I knew if I continued to work hard at networking and working as an artist I could make it a mobile job. If you had to wear a mask for the rest of your life, what would it be? I’m not sure how to answer this. I have a very stuffy nose right now so the idea of wearing a mask sounds like it would suffocate me……So I would choose a mask like Geordi has on Star Trek to cover my laser vision. Where is the last place you went skinny dipping? 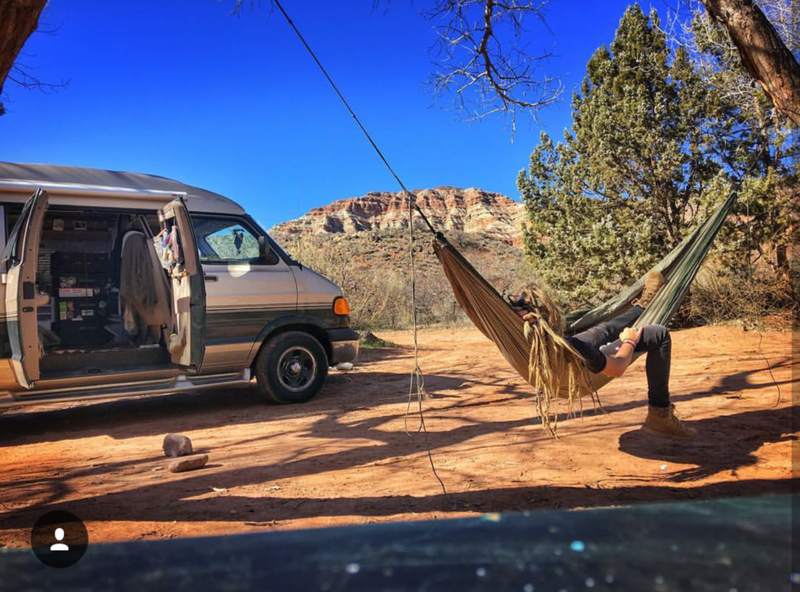 Where has your favorite place to wake up in the van been? Oh wow, this is hard. There have been a couple places I remember not wanting to get out of bed because I was so overwhelmed at my view from my “bedroom” window…..Big Sur, California and Valley of Gods in Mexican Hat, Utah. Do you have any lucky items or trinkets? I think the only item I have I would consider a lucky trinket is the Third Eye Pinecone I have worn everyday for the past year. How long do you plan to travel and does anything "guide" your route? I plan on doing it as long as I can. Hopefully for 10 years!! The only things that “guide” my route are if friends and family want to make plans with me in whatever state they're in or a job opportunity. Otherwise I let the universe guide me. I was supposed to be in Florida in January but I’m in Nevada now because I was invited to a music festival and a glass show in February. THEN I was going to start heading toward Texas but I was asked to go to a Hot Air Balloon show in Utah next week, sooooooo looks like my plans changed again. What is a mystery to you? Life. Every day. People. Tomorrow is never promised and today is exactly where you should be. Mystery is not knowing where you’ll sleep tomorrow night, or not knowing who your next meal will be next to, what new friends you’ll make next week, or what problem will make you a stronger person next month….it’s all very exciting if you ask me. What difficulties have you found along the way? I also miss some core groups of friends I have that are in the Midwest. I haven't been back there since September and I have realized that the greatest gift I have received in this life is friendship. I am so thankful for the new friendships I have made while on the road, but I am also sad that I don't get to see my friends I've known for 10+ years as much....Being on the road you are constantly meeting new people. It carries that idea that you can "reinvent" yourself every time you're somewhere new. It's a fresh start. No one knows anything about me. But I find that this is exhausting. I find myself not getting to know people as well as I'd like because I assume they won't get to know me in the short amount of time we have together. I miss that deep connection with friends who have known me through all stages of my life so I can truly be understood and feel like myself. And obviously there are instances where I meet people and I instantly feel a connection like we have been friends for forever, but more times than not I feel detached from myself. What would your super hero name be, and what outfit would you be wearing? Super Lyn (Because that was my MySpace name back in 2005) and I would wear a onesie that looked like a unicorn. Could you describe your artwork in three words? I have been inspired by a lot of cartoons that I watched while growing up and also as an adult. My favorites are Studio Ghibli films like Spirited Away, Princess Mononoke and Ponyo. I also am inspired by the weird and grotesque shows on Adult Swim like SuperJail, Super Mountain Fort Awesome and Rick and Morty. Other shows that inspire me are Adventure Time and Star Trek. My favorite artists who inspire me are Ralph Steadman, Alex Grey, Salvador Dali, Oliver Hibert, Shel Silverstein, Alex Paradee and Mr. Melty. When I sit down to draw or paint I always have music playing. I find that music helps me get in the creative mindset, especially if I get an artist block. I normally play Modest Mouse, which has been a band that’s inspired me since I was 11, and also Dr. Dog, Animal Collective and Cloud Cult. These bands paint such beautiful scenes in my head with their poetic lyrics it’s hard not to be inspired when I turn them on. Sometimes, when I’m at a campsite I do.. I’ll wake up, listen to some music while I lay in bed for an hour or two then get up to make coffee and breakfast. After that I plan my day around whether I need to do errands, make art, go to the post office or just chill and explore. What about a creative routine? I find that when I want to create a painting or drawing I go through many different stages of creative development. Sometimes I will have a concept or plan for a piece that I want to execute it exactly how I see it in my mind. Other times I have no idea what I want to put on paper so I just let my hands draw with no specific intention. When I do have a concept I want to get out I almost never execute it how I was imagining it in my head. That can be frustrating. I have recently been trying to let go of the idea of making a piece exactly how I see it in my head and instead just be happy with the result of not knowing how a piece will turn out in the end at all. I have enjoyed this process a lot more and I think that’s because I really enjoy mystery. Favorite thing(s) about van life? Least favorite? Favorite things: 1) I wake up in a new place almost every day. It never gets old. 2) I have met so many amazing people on the road that I wouldn’t have if I wasn’t doing what I was doing. 3) The mystery. Least Favorite: I hold in my pee more than I have ever before. What advice would you give someone wanting to downsize into a van or tiny home? Do you really need a lot of what you’ve got to survive? The answer is no. Everything is just materialistic. Items. Things. When you really think about the things you use EVERYDAY or every week it’s a lot less than you’d think. But when it comes down to the logistics of living in a van, definitely do research! See what other people are doing, what they aren’t doing, and mold it to your own, comfortably. Any specific struggles to being an artist you'd like to share? I am my own boss, which is awesome, but also exhausting. I have to discipline myself to create a certain amount during the week and communicate with a lot of people via email, Facebook, instagram, phone call and in person. I find that I tend to over work myself because I think that since I am traveling and living a life free of the 9-5 job that I need to make up for that. But I end up working everyday and forget to give myself a break. I have to remind myself that I can’t burn myself out creatively by trying to create every single day. I have to constantly remind myself that I don’t need to make money every day and that my brain needs a break from creating in order to stay fresh. I also get tired of being social and outgoing all the time because you have to be those things in order to get your work into the world. I am constantly talking to strangers and showing my work off which drains me more than I can explain. Sometimes I just want to crawl in a hole and paint away until I forget what humans look like. In short, I become a hermit which isn’t the best when my job depends on me networking and talking to people. I am excited for what this year has to offer when it comes to my artist journey. I don’t know where I’ll be next week, next month or next year, but I know if I continue to put in the hard work that I have been that I’ll get out exactly what I need from it. So far I am exceptionally happy with where I am and extremely excited for the mystery of what life holds for me in the future. Piece of advice from mom or dad: Just do what makes you happy. Chuck Norris joke: Ever heard that joke about Chuck Norris? Me Neither. I’m out of the loop. See what's for sale in the shop here.